With a stay at Hotel Amalfi, you'll be centrally located in Rome, steps from Basilica di Santa Maria Maggiore and 9 minutes by foot from Via Nazionale. This hotel is 0.7 mi (1.1 km) from Colosseum and 0.7 mi (1.1 km) from Roman Forum. A stay at Hotel Terminal places you in the heart of Rome, within a 10-minute walk of Via Nazionale and Basilica di Santa Maria Maggiore. 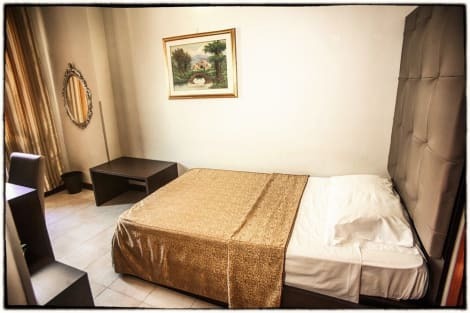 This hotel is 0.4 mi (0.6 km) from Teatro dell'Opera di Roma and 0.4 mi (0.6 km) from Via Marsala. Make yourself at home in one of the 34 air-conditioned rooms featuring free minibar items and LCD televisions. Your room comes with a Select Comfort bed. Complimentary wireless Internet access keeps you connected, and satellite programming is available for your entertainment. Private bathrooms with showers feature complimentary toiletries and bidets. Featured amenities include limo/town car service, complimentary newspapers in the lobby, and a 24-hour front desk. A roundtrip airport shuttle is provided for a surcharge (available 24 hours), and self parking (subject to charges) is available onsite.